Will they ever get used? When deciding on our next family adventure and weighing up the options, the children’s opinions obviously always mattered and were going to play a big part in our decision making. When going to the UK became a serious option it was obvious that this was a popular choice for both my two oldest kids for a number of reasons and top of that list of reasons was that they really wanted to see, feel and enjoy snow. For the last 2 months I have been telling them both that snow is unlikely and that it may only happen once a year if that. They all got a plastic sledge each from Santa (grandma) for Christmas, wrapped up in black bin bags (Santa doesn’t seem to do large wrapping paper? ), and momentarily used on the living room floor as they tried to imagine what it would be like to use them but not knowing when. Little did we all know that they would be in full action less than from 48 hours from then. We were driving back from the sales as the light was fading late on the 26th. In the car headlights large flakes of snow began to glide through the beams and we all shouted out that it was snowing! It got denser as we drove home, a lot like going into ‘hyper-drive‘ on the Millennium Falcon (apparently). The kids were desperate to get outside and to feel the snow and as soon as we parked up the car they pulled on their winter coats and dived into grandma’s backyard to adsorb the new experience. I explained to the kids (and my wife, who was just as excited) that the snow may not last for long and can soon thaw and turn to a brown slush, especially if it rains overnight. 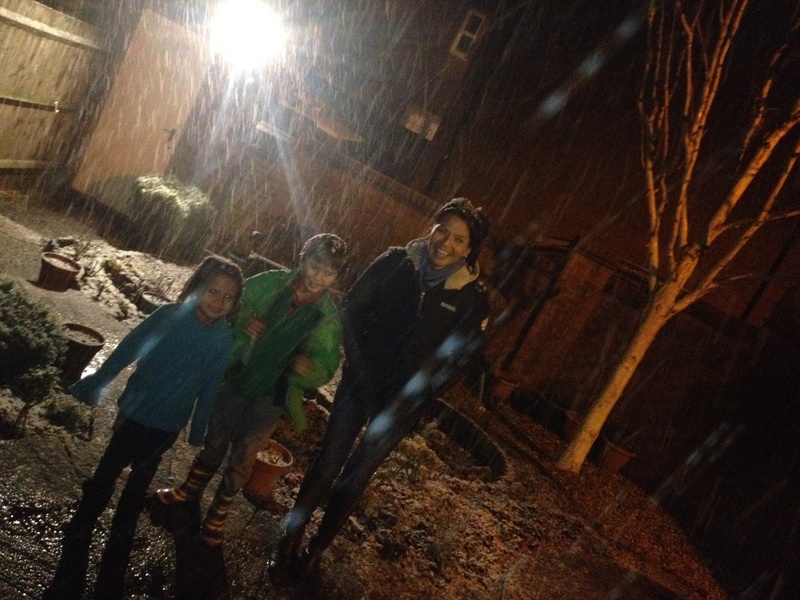 Even though it was now night time we decided to make the most of the opportunity and had our first family snowball fight, making sure a few snowballs also found their way through grandma’s front door at the same time! 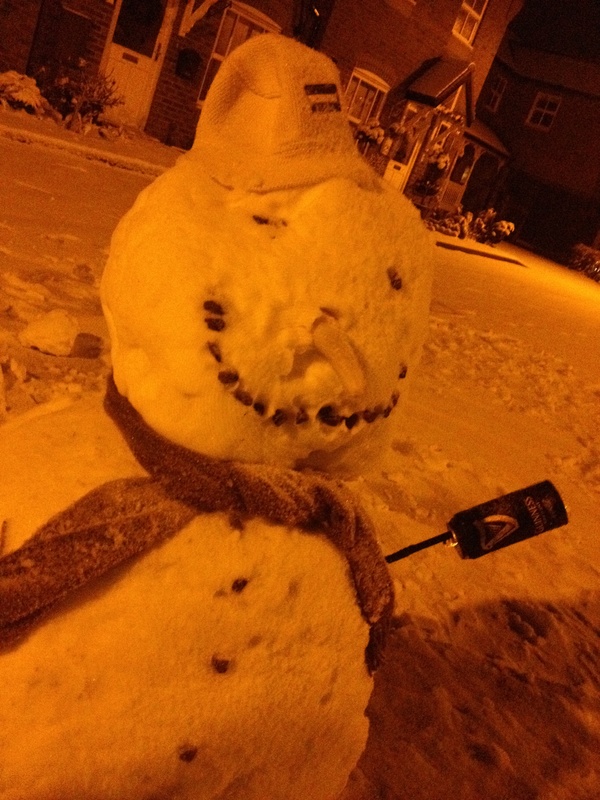 The snow was settling and the conditions perfect to build a snowman. I showed Jonah how to start with a small lump of snow at the top of the road and then roll it down the hill, “this is perfect rolling snow Jonah” – constantly flipping it over as it increased in size and trying to maintain a rounded shape. I worked on his body and Jonah made his first ever snowman head. We added some small stones for eyes, his mouth and buttons, and of course gave him a carrot for his nose. The garden bush was hacked for some arms and a forgiving grandma donated an old scarf and hat for him to wear. 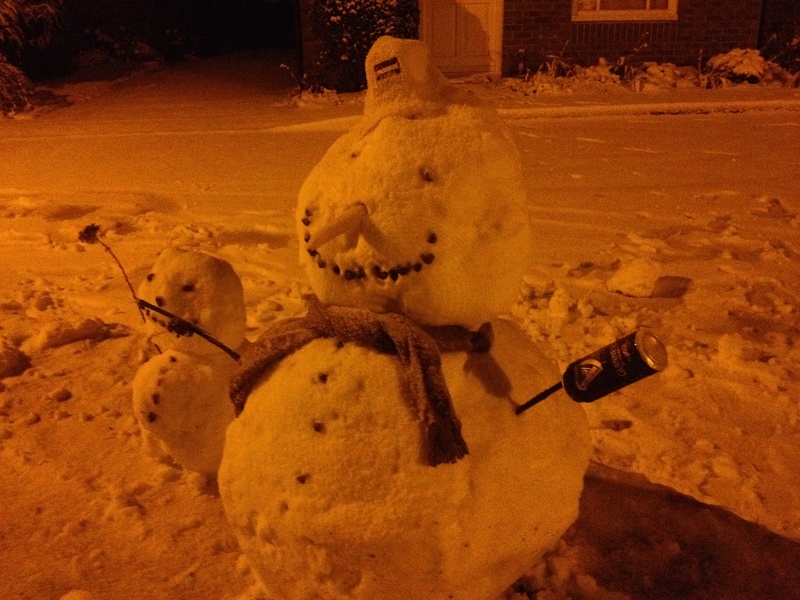 The finishing touch was an empty can of Guinness which had helped keep dad warm through the activity and we both thought the snowman would appreciate (the idea of) it – hence his larger than life smile, he had waited a long time. Is there anything better than waking up to find the world covered in a crisp blanket of dazzling snow with clear blue skies and a sparkling winter sun? 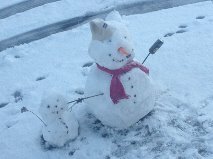 Seeing your two special snowmen friends smiling up at you and coaxing you out to play? 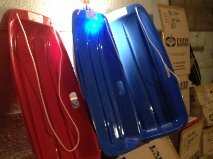 Knowing there are three brand new shiny plastic sledges in the shed that are going to be christened today? Plastic bags in between double layers of socks, thermos flasks filled and rations packed away, we are all ready for a full day of family sledging for the first time. There can’t be many better days than this, they are definitely worth the wait. This entry was posted in Culturally Aware and Interactive, Expressing the Artist in You, Paul Crouch, Reflective Practice by Paul Crouch. Bookmark the permalink.